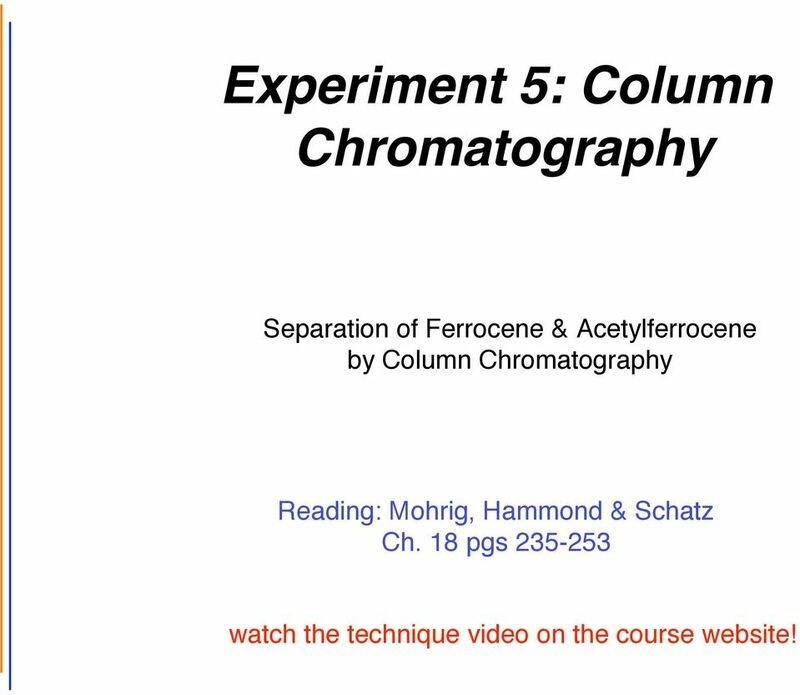 Download "Experiment 5: Column Chromatography"
1 Experiment 5: Column Chromatography Separation of Ferrocene & Acetylferrocene by Column Chromatography Reading: Mohrig, Hammond & Schatz Ch. 18 pgs watch the technique video on the course website! 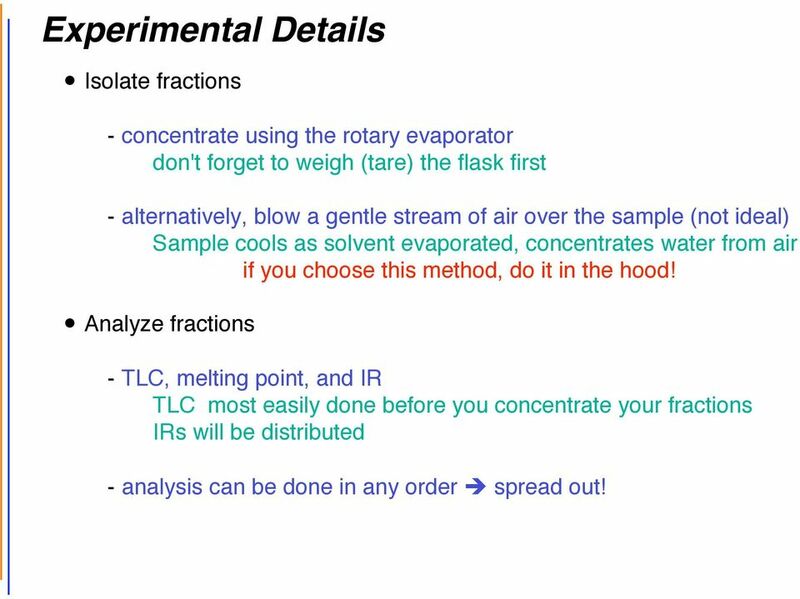 11 Experimental Details Isolate fractions - concentrate using the rotary evaporator don't forget to weigh (tare) the flask first - alternatively, blow a gentle stream of air over the sample (not ideal) Sample cools as solvent evaporated, concentrates water from air if you choose this method, do it in the hood! 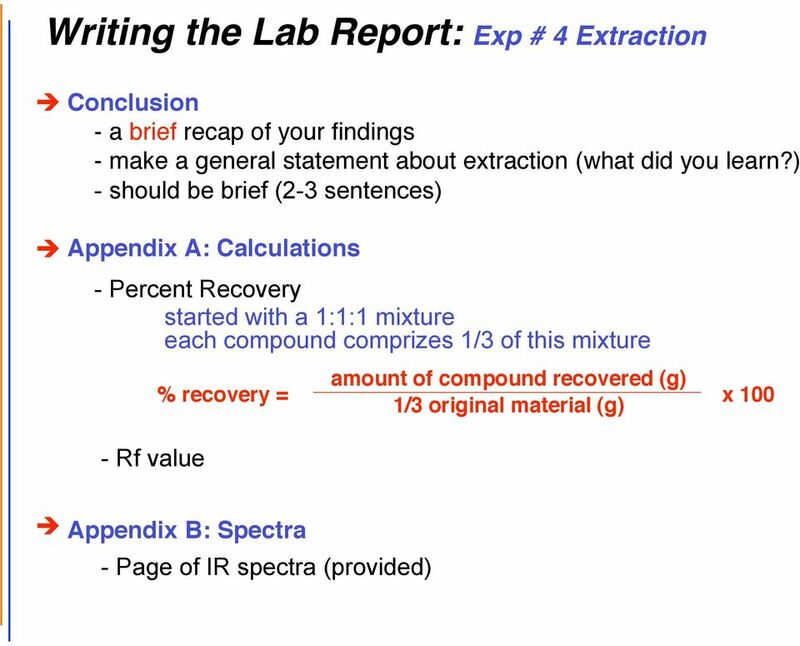 Analyze fractions - TLC, melting point, and IR TLC most easily done before you concentrate your fractions IRs will be distributed - analysis can be done in any order spread out! 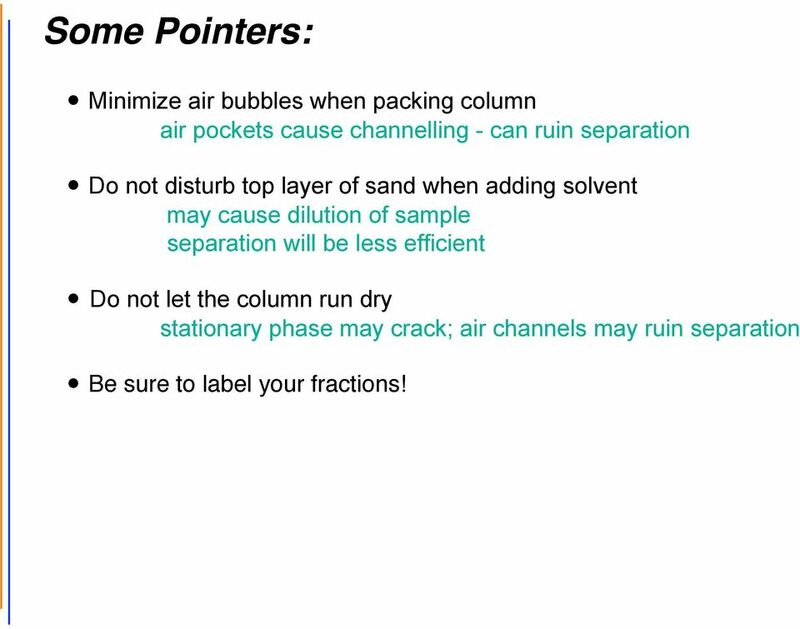 12 Some Pointers: Minimize air bubbles when packing column air pockets cause channelling - can ruin separation Do not disturb top layer of sand when adding solvent may cause dilution of sample separation will be less efficient Do not let the column run dry stationary phase may crack; air channels may ruin separation Be sure to label your fractions! 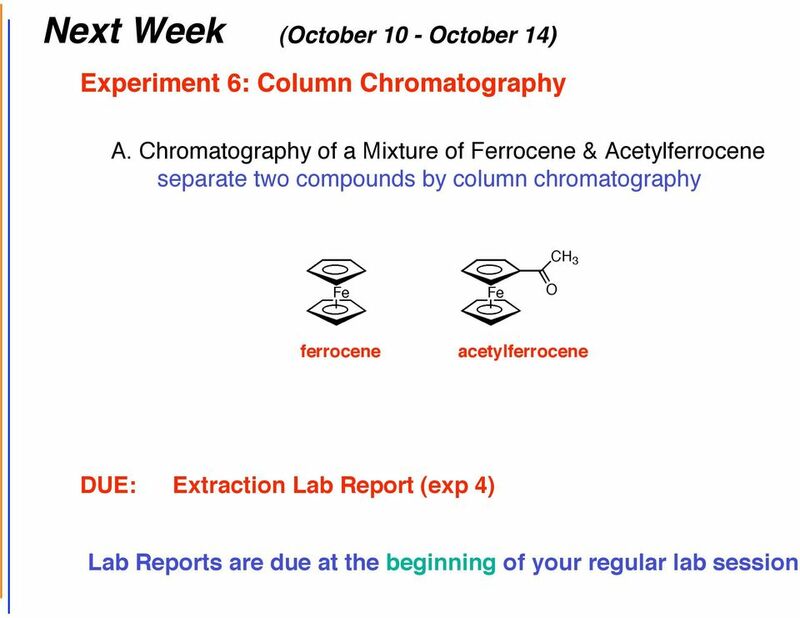 13 Writing the Lab Report: Exp #4 Extraction Purpose - technique experiment: what will you learn? - what conclusions will you reach? - a general discussion of theory/expected results is not a purpose! 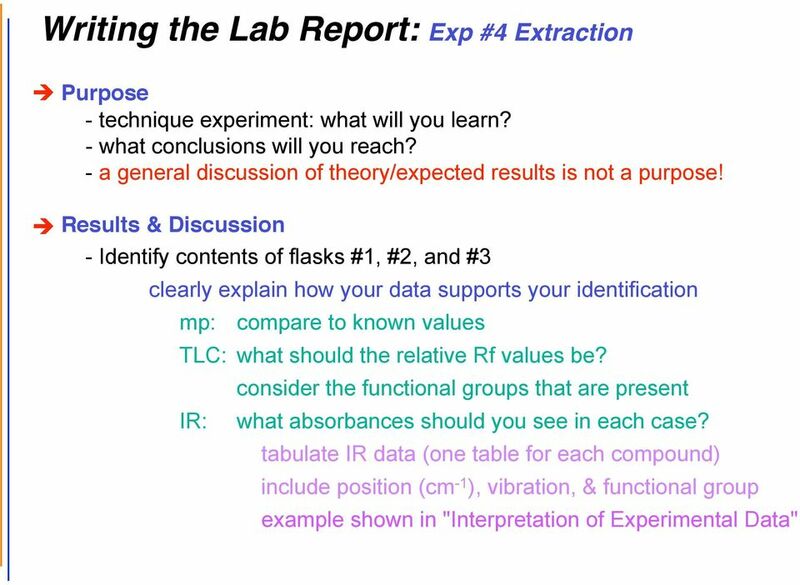 Results & Discussion - Identify contents of flasks #1, #2, and #3 clearly explain how your data supports your identification mp: compare to known values TLC: what should the relative Rf values be? consider the functional groups that are present IR: what absorbances should you see in each case? 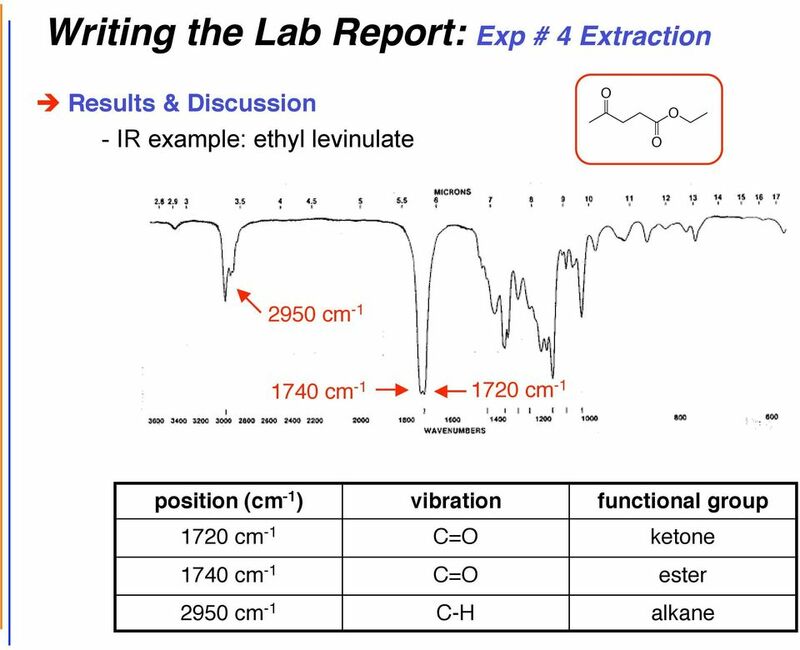 tabulate IR data (one table for each compound) include position (cm -1 ), vibration, & functional group example shown in "Interpretation of Experimental Data"
15 Writing the Lab Report: Exp #4 Extraction Results & Discussion - Discuss the success of your separation basically: how well did the compounds separate? in other words, how pure are they? 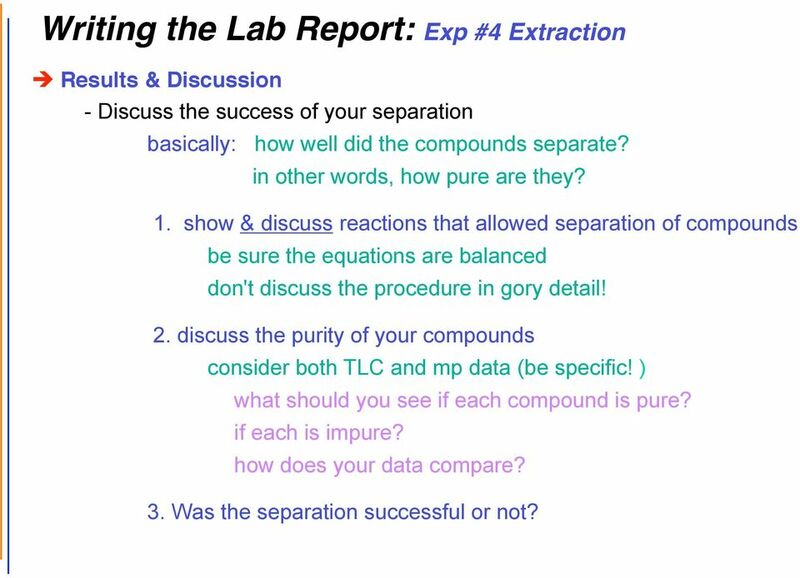 1. show & discuss reactions that allowed separation of compounds be sure the equations are balanced don't discuss the procedure in gory detail! 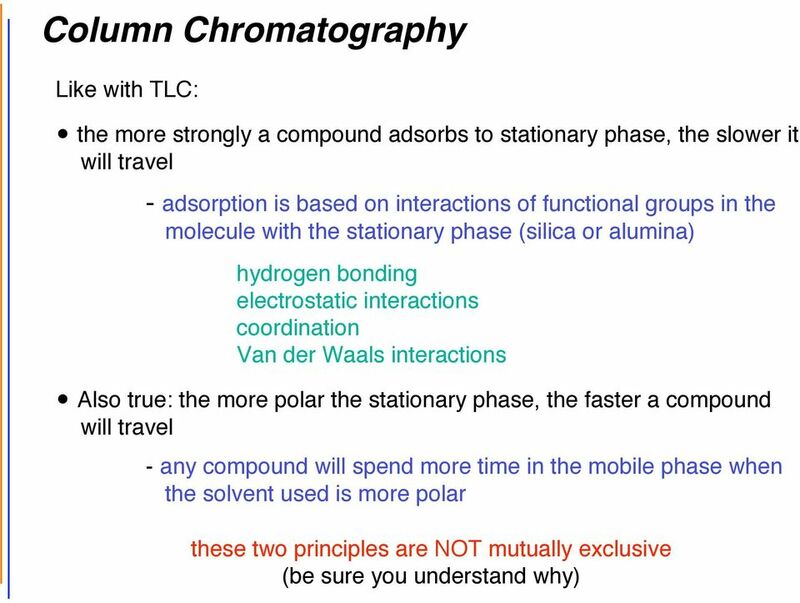 2. discuss the purity of your compounds consider both TLC and mp data (be specific! ) what should you see if each compound is pure? if each is impure? how does your data compare? 3. Was the separation successful or not? 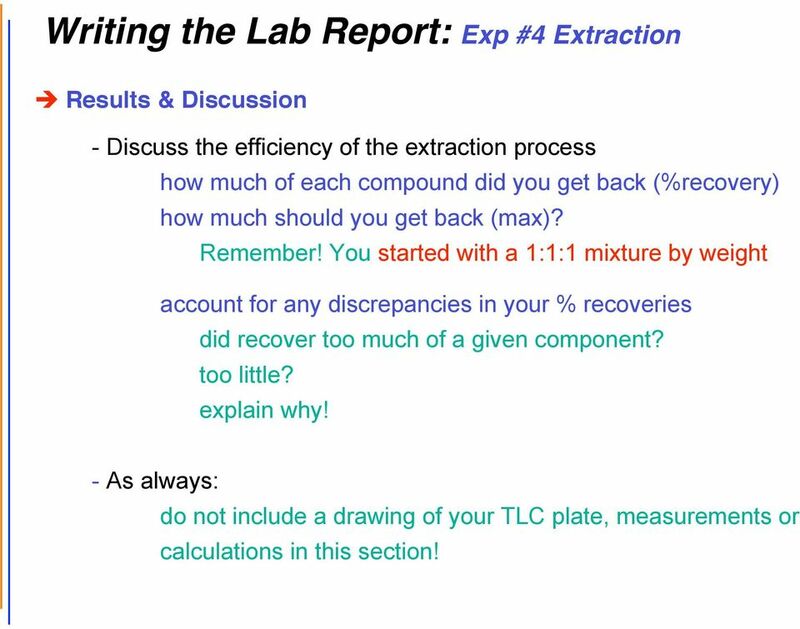 16 Writing the Lab Report: Exp #4 Extraction Results & Discussion - Discuss the efficiency of the extraction process how much of each compound did you get back (%recovery) how much should you get back (max)? Remember! You started with a 1:1:1 mixture by weight account for any discrepancies in your % recoveries did recover too much of a given component? too little? explain why! - As always: do not include a drawing of your TLC plate, measurements or calculations in this section! 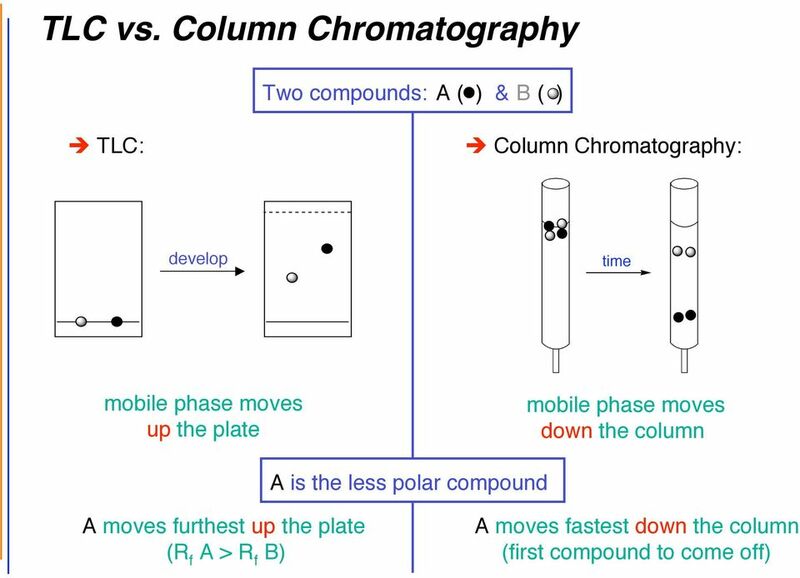 For Chromatography, you must remember Polar Dissolves More, not like dissolves like. 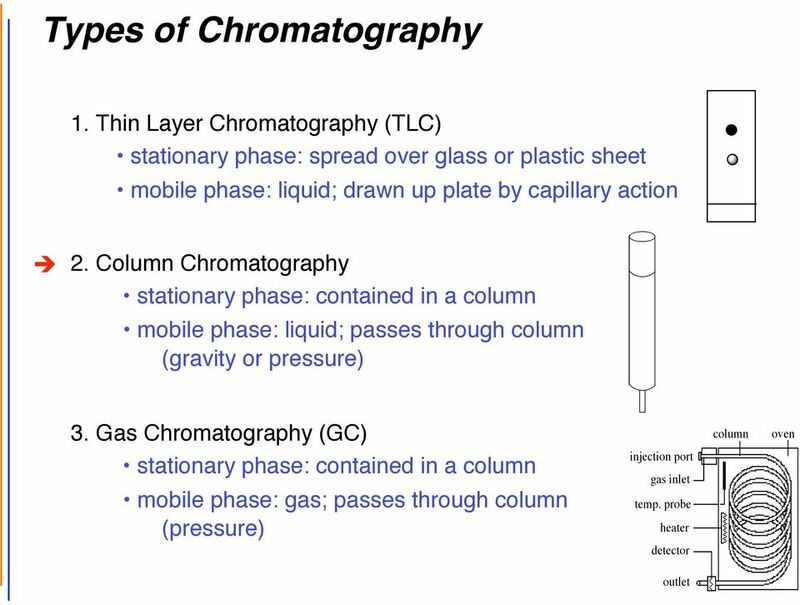 Thin Layer and Column Chromatography Chromatography is a widely used chemical separation method that takes advantage of different affinities of compounds to a fixed or stationary phase and a mobile phase. 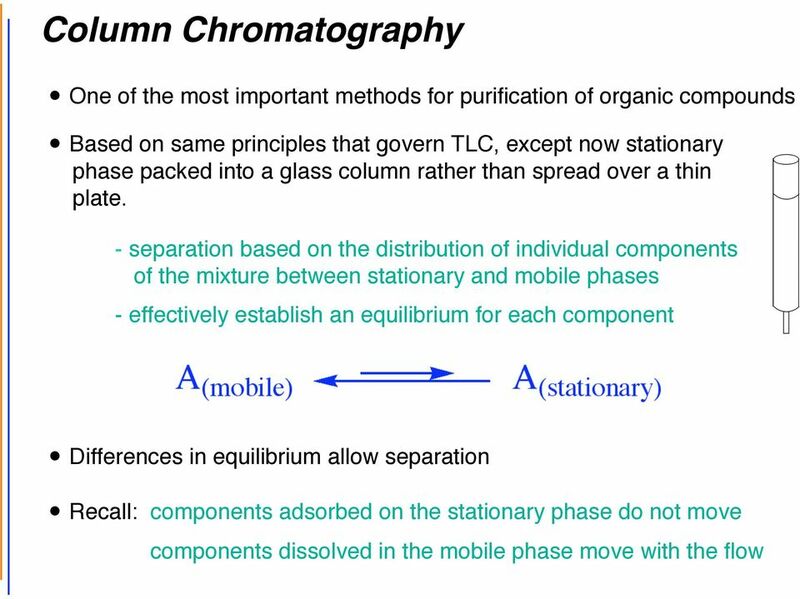 Paper Chromatography: Separation and Identification of Five Metal Cations Objectives Known and unknown solutions of the metal ions Ag +, Fe 3+, Co 2+, Cu 2+ and Hg 2+ will be analyzed using paper chromatography. Spectrophotometric Analysis Overview: Spectrophotometry can be used in as an analytic tool in two significant ways. The light absorbed by a particular species will produce a pattern called a spectrum. experiment5 Understanding and applying the concept of limiting reagents. Learning how to perform a vacuum filtration. 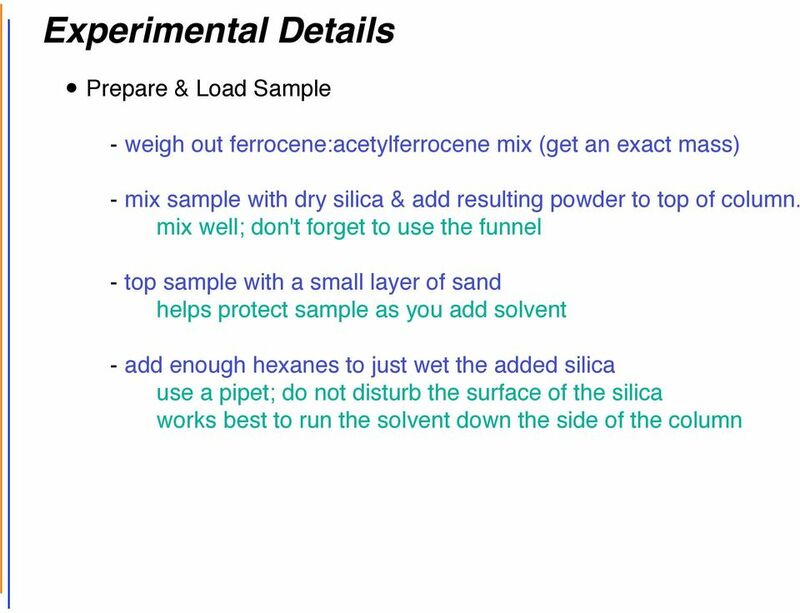 EXPERIMENT 4: Separation of a Mixture of Solids Read the entire experiment and organize time, materials, and work space before beginning. Remember to review the safety sections and wear goggles when appropriate. How Can the Percent Composition of a Salt, Sand and Iron Mixture be Determined? 1 Experiment 4: Thin Layer hromatography (TL) In LT, read the introduction to Part 4, hromatography, on pp 253-254, then read pp 255-269, hapter 18. View video 18.1 Thin-layer hromatography at http://www.macmillanlearning.com/atalog/studentresources/mohrig4e. Purification of reaction mixtures using flash chromatography. Purification of reaction mixtures using flash chromatography. 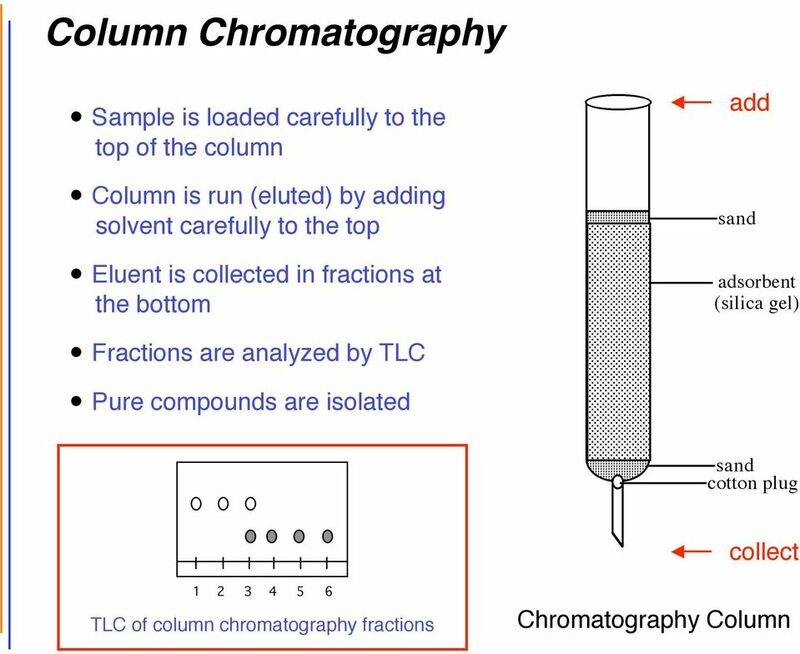 This technical note details the use of ISOLUTE Flash chromatography columns for the purification of reaction mixtures. What is flash chromatography? This acid is strong. Be careful. What is the Percent Copper in a Compound? Title: Training Lab 1 Chemistry 11100, Fall Use of a balance a balance is used to measure the mass of solids in the chemistry lab. XPRIMNT 5: lectrophilic Aromatic Substitution A Friedel-Crafts Acylation Reaction Relevant Sections in the text (Wade, 7 th ed.) 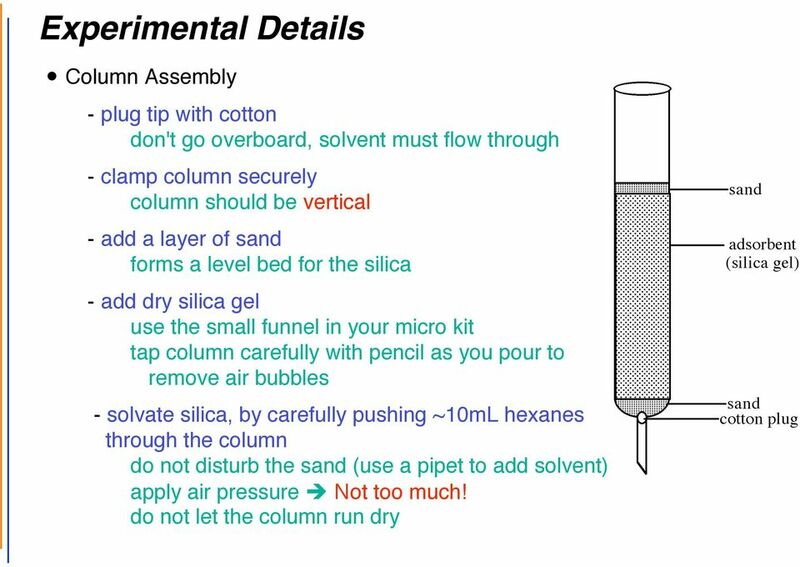 17.1-17.2 (p. 751-755) lectrophilic aromatic substitution 17.6-17.8 (p.
In this experiment, we will use three properties to identify a liquid substance: solubility, density and boiling point.. 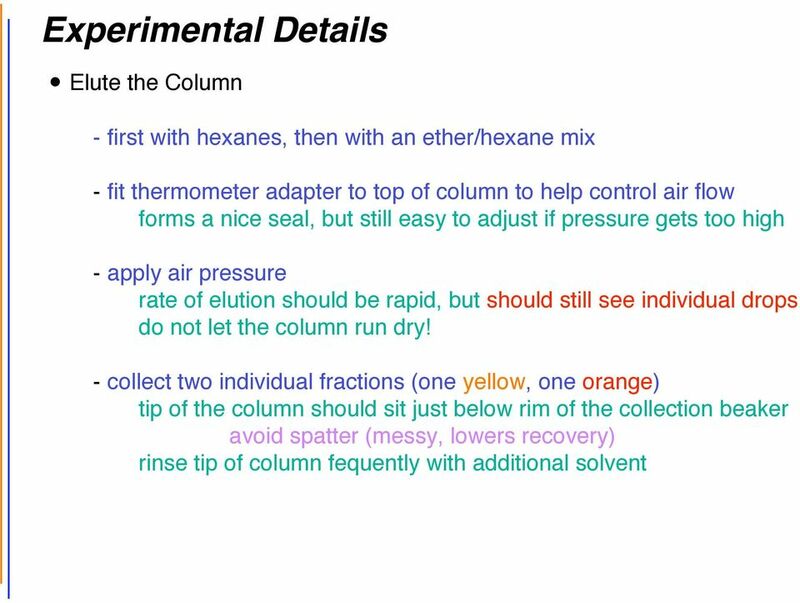 EXPERIMENT 7 DISTILLATION PRELAB ASSIGNMENT 1. Prepare a Table of Physical Constants for this experiment, for the compounds, ethyl acetate and 1-butanol. Include boiling point and refractive index. 2. CHEM 121L General Chemistry Laboratory Revision 1.2 Determination of the Molecular Weight of a Volatile Liquid Learn about the Gas Laws. Learn about the Dumas Method of Molecular Weight determinations.